COLUMBIA, S.C. (AP) — Quarterback Michael Scarnecchia spent years dreaming of starting at South Carolina, until he learned about things even bigger than his wishes. That’s what made the Gamecocks senior, making his first college start, so pleased with his performance against Missouri on Saturday. Scarnecchia certainly did that Saturday, throwing for three touchdowns and leading the Gamecocks (3-2, 2-2 Southeastern Conference) to Parker White’s 33-yard, game-winning field goal with two seconds left in a 37-35 win over the Tigers (3-2, 0-2). Scarnecchia, part of South Carolina since 2014, was called on with starter Jake Bentley sidelined with a knee injury. And he rose to the challenge in a rain-affected, weather-delayed game that took more than five hours to finish. For Scarnecchia, few moments were bigger than a 27-yard pass to tight end Kyle Markway into Missouri territory and a 12-yard toss to Bryan Edwards moments later on the final drive that set up Parker’s winning kick. “I felt like I was really prepared,” Scarnecchia said. Few were prepared for a game like this. The Gamecocks trailed 23-14 at halftime, yet inexplicably rallied for a 31-23 lead as rain poured down throughout the third quarter. Parker’s second 42-yard field goal gave South Carolina a 34-32 edge with Missouri driving when radar showed lightning in the area with 2:41 to go that led to a weather delay of one hour, 16 minutes. Once the game resumed, Missouri’s Tucker McCann hit a 57-yard field goal that put the Tigers up a final time, 35-34, with 1:18 left. That’s when Scarnecchia drove the Gamecocks one last, dramatic time. When White’s kick sailed through, only a few thousand soggy fans remained from the announced crowd of 73,393. “Wow, what a game, a wild game,” South Carolina coach Will Muschamp said. Scarnecchia had first-half TD passes of 5 and 17 yards to Edwards in the first half and 8 yards to Deebo Samuel in the third quarter. Scarnecchia completed 20 of 35 passes for 249 yards. Missouri’s Lock, the SEC leader at 320 yards passing a game coming in, was held to his lowest total of the season at 204. 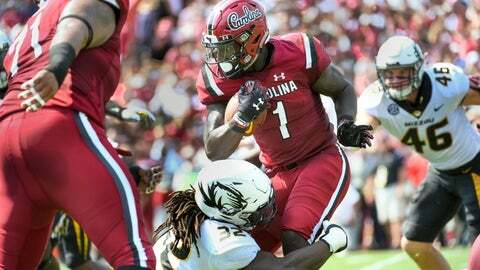 The Tigers had eight trips inside South Carolina’s 20 and came away with just three touchdowns. Coach Barry Odom thought those lost chances cost his team. “I’m trying to put on a good face right now, because I’m not happy,” he said. Missouri: This was the Tigers game to win as they squandered four chances to score touchdowns when inside South Carolina’s 20, instead settling for field goals. Missouri will have to learn to close these out if it hopes to rise in the SEC East. South Carolina: The Gamecocks looked like a team without much spirit in the opening half. The third-quarter rains changed all that as the Gamecocks rebounded in difficult circumstances in the come-from-behind victory that should serve them well going forward. Muschamp thought this was the craziest game he’d ever been in. The rain knocked out both the time and play clocks in the third quarter, headsets were lost and the rain was so heavy players were sliding after runs and tackles. And just when it looked like it might conclude, lightning in the area caused a lengthy delay with less than three minutes left. Bentley, a junior, sustained his knee injury at Kentucky last week. He practiced most of the week, was suited up and went through warmups with his team. Muschamp said he would know better about Bentley’s status for next week by Tuesday. Missouri: Plays at No. 1 Alabama next Saturday night. South Carolina: Hosts Texas A&M on Saturday.